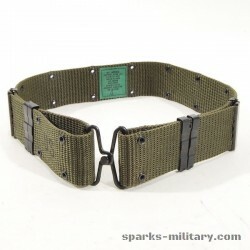 The M-1956 LCE continued the traditional fighting load concept of an individual equipment belt supported by individual equipment belt suspenders. 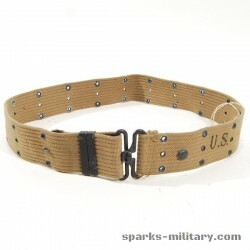 It differed from previous United States military designs, however, by relying on a single individual equipment belt for soldiers armed with all small arms as opposed to three separate individual equipment belts; the M-1936 individual equipment belt, the M-1923 cartridge belt for the Rifle, Caliber .30, M1, and the M-1937 cartridge belt for the Rifle, Caliber .30, Automatic, M1918. 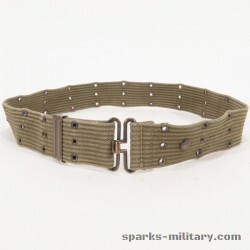 The olive drab U.S. Army Shade 7 cotton canvas "Belt, Individual Equipment" is manufactured to United States military specification MIL-B-40158 and is produced in two sizes: Medium, for waists under 30-inches (FSN 8465-577-4925), and Large, for waists over 30-inches (FSN 8465-577-4924). 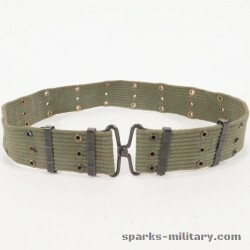 Earlier production individual equipment belts feature a horizontal canvas weave while later patterns feature a vertical weave. 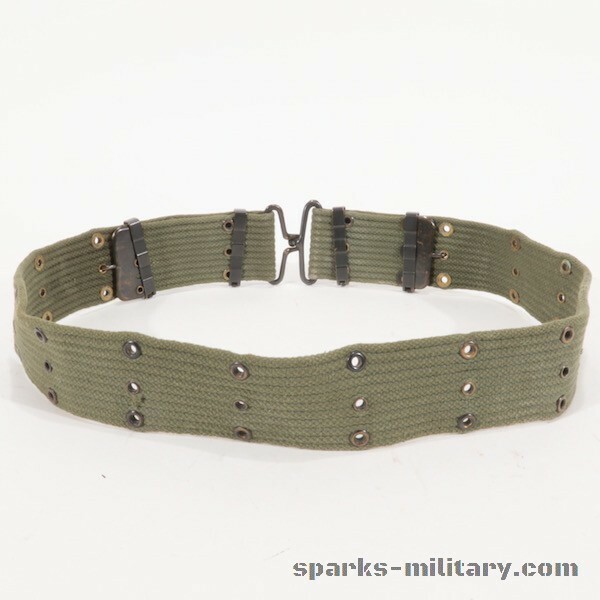 It is secured by means of a brass hook and loop buckle and has two rows of eyelets along the top and bottom for attaching individual equipment utilizing the M-1910 wire hanger. 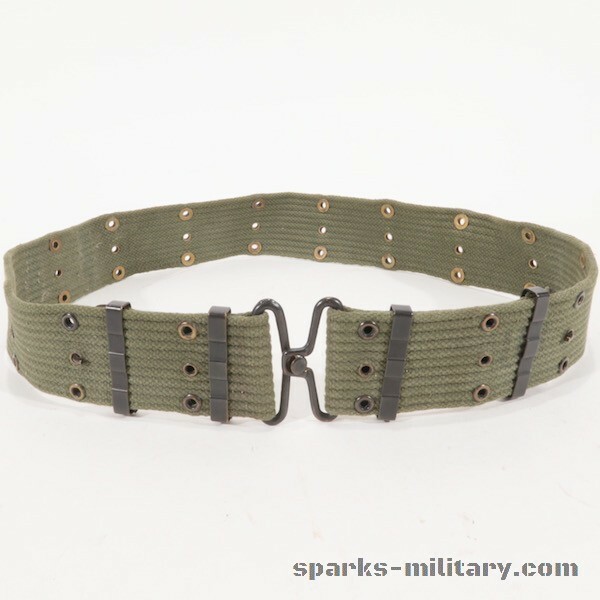 There is a center row of smaller eyelets utilized for adjusting the size of the individual equipment belt. 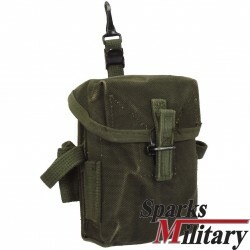 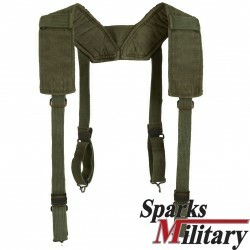 The olive drab U.S. Army Shade 7 cotton canvas "Suspenders, Individual Equipment Belt" (also designated "Suspenders, Field Pack, Combat, M-1956") were manufactured in Regular (FSN 8465-577-4922), Long (FSN 8465-577-4923), and X-Long (FSN 8465-823-7231) lengths to United States military specification MIL-S-40160. 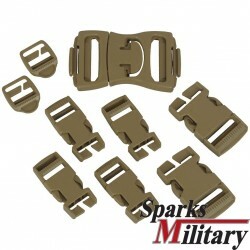 They are additionally adjustable in length by means of sliding metal friction fasteners. 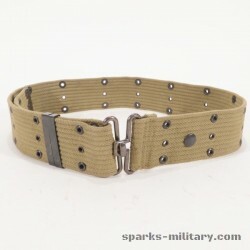 Early production individual equipment belt suspenders attach to the individual equipment belt by means of open bent-wire hooks which are attached to the individual equipment belt's upper set of eyelets. 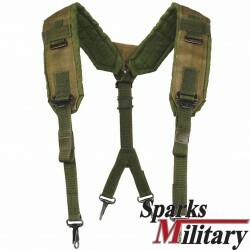 Later production individual equipment belt suspenders utilize closing hooks in the rear and open cast hooks in the front. 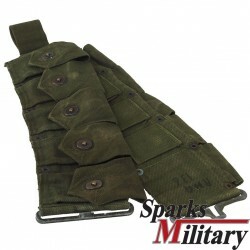 The individual equipment belt suspenders feature a row of web straps over the shoulders for attaching equipment and each side featured a metal rectangular ring where the frontal web straps and the padded shoulder portion joined for additional equipment attachment. 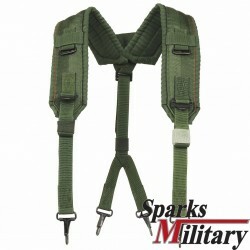 The underside of the padded portion of the suspenders is a thinner canvas in earlier-production suspenders and nylon in some of the latest examples.